In the public sector, the following are identified as researchers: civil servants with the profession of research director, University professors, research fellows and senior lecturers; non-permanent staff recruited at a level equivalent to the professions mentioned above; staff under private status (e.g. in State-owned industrial and commercial establishments (EPIC)) whose duties are equivalent to those of civil servants as mentioned above; research engineers and equivalent groups; doctoral students funded to complete their thesis; temporary research and teaching assistants (ATER). In business enterprises, R&D researchers and engineers are scientists and engineers engaged in the conception or creation of new knowledge, products, processes, methods and systems. Ancillary research staff are all personnel who are not researchers and who contribute to carrying out R&D projects or who are directly associated with this work: technicians and equivalent staff, clerical staff and secretarial staff. Staff are distributed in one or more branches of economic activity where R&D is carried out. These 32 research branches are based on the French classification of economic activities (NAF rev.2). Full-time equivalent researchers (FTE): to correctly evaluate the human potential in R&D, it is necessary to consider the annual full-time equivalent number of researchers, in order to take account of part-timers and researchers with multiple activities (research, teaching, treatment, etc.). In 2013, over half a million people were involved in research activity in France. Women represented 30% of all research personnel and 26% of researchers. The number of researchers, 266,200 full-time equivalent (FTE) in 2013, has increased by 17% in five years. The number of researchers increased more rapidly in business enterprises (26%) than in government (5%) over the period 2008-2013. In 2013, 575,300 people in France were involved in research-related activity. They represented 418,100 full-time equivalents (FTE), an increase of 9.3% in 5 years (table 36.01). The number of researchers increased by 16.9% in 5 years, from 227,700 FTE in 2008 to 266,200 FTE in 2013. The number of ancillary staff fell, however (-2.0% over 5 years). Researchers accounted for 64% of research staff in 2013, and the 'ancillary staff to researcher' ratio stood at 0.57 in 2013 compared to 0.68 in 2008. In 2013, business enterprises employed 161,900 FTE researchers. These numbers had increased 26.1% since 2008. In the government sector, researcher numbers had grown less rapidly (+5.1% in 5 years) and stood at 104,300 FTE. Since 2002, researchers in business enterprises have outnumbered those in government and in 2013 they represented 61% of all researchers. Almost half of all research personnel in business enterprises (48%) are concentrated in five of the 32 branches of research (chart 36.02): 'Computer-related and information service activities' (12%), 'Manufacture of motor vehicles' (11%), 'Specialised scientific and technical activities' (10%), 'Manufacture of air and spacecraft and related machinery' (10%), 'Manufacture of instruments and appliances for measuring, testing and navigation; watches and clocks' (7%) (chart 36.02). Between 2008 and 2013, the number of researchers in the service branches increased 7 times more (+77%) than those working in industrial branches (+11%) and the "primary, energy and construction" branches (+15%). The proportion of women working in research was 30% in 2013. This figure is lower for researchers (26%) than for ancillary staff (35%). It is also lower in business enterprises (22%) than in the government sector (40%). In government, more than three out of four research personnel have permanent posts. There is a greater proportion of permanent staff among ancillary staff (88%) than among researchers (71%), as some researchers are doctoral students (chart 36.03). In not-for-profit institutions, only 63% of research staff and 42% of researchers hold permanent posts. Within the European Union, France is in second place for the number of researchers (FTE), behind Germany. The United Kingdom is in third position. At global level, the European Union is ranked first, with 1.7 million FTE researchers, ahead of China (1.4 million) and the United States (1.3 million). In relation to the active population, France had 9.13 researchers per thousand workers in 2013, behind South Korea and Japan, but ahead of the United States, Germany and the United Kingdom (chart 36.04). Several less populated countries rank among the world leaders, especially Finland, Taiwan and Sweden. Extract from the chapter "36. human resources in research and development". Break in series. From 2010, a change in methodology resulted in a reduction of around 6,000 FTE in government. 2 Including the French national centre for scientific research (CNRS). The data on the graph show staff numbers in the 10 largest branches of research in terms of researchers in 2013. The other 22 branches are grouped together under the headings 'Other industrial branches' and 'Other service branches'. 3 Staff who are paid out of own funds are counted only in the 103 institutions with wider responsibilities and capacities in 2013. Doctoral students receiving pay and temporary research and teaching assistants (ATER) are counted in all institutions. The 23 countries shown are those with the most FTE researchers in 2013. L’État de l’emploi scientifique 2016 correspond à une publication statistique biennale. Elle rassemble des études et statistiques permettant d'éclairer les différents domaines d'activité des personnels qui relèvent de l'emploi scientifique en France. Il couvre à la fois la recherche menée dans les organismes et les établissements d'enseignement supérieur et celle réalisée en entreprise. La nouvelle édition 2016 permet de mieux connaître la recherche menée dans les organismes et les établissements d'enseignement supérieur et celle réalisée en entreprise. 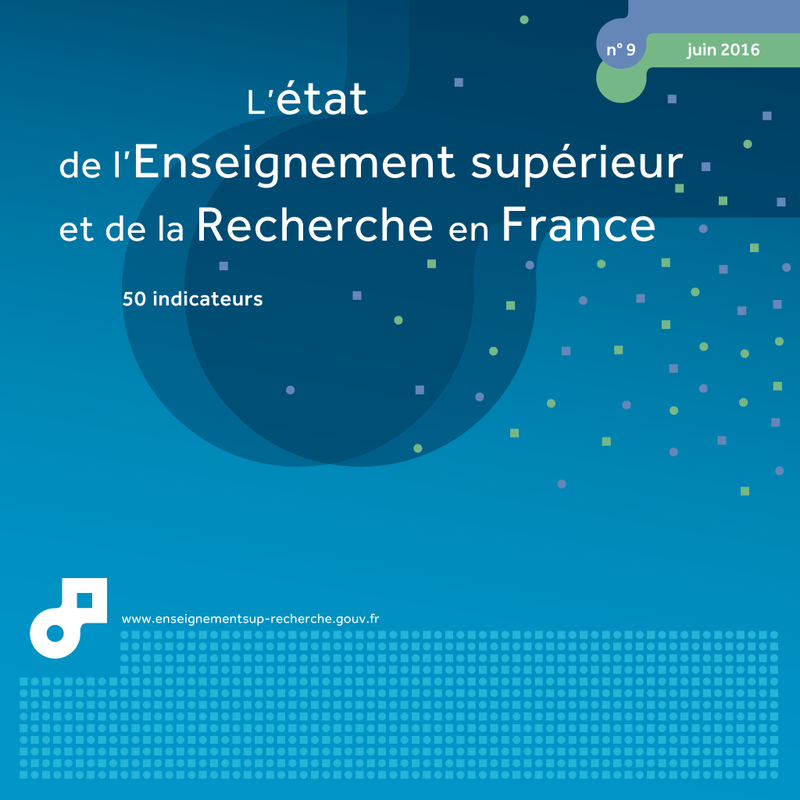 En effet, le rapport 2016 intègre une approche de l'emploi scientifique par grands champs disciplinaires avec une consolidation ou une mise en cohérence des données portant sur les établissements d'enseignement supérieur, les organismes de recherche (EPST/EPIC) et les entreprises. Les données statistiques sont présentées selon des périmètres, conventions et unités communs, conformément aux conventions internationales édictées par le manuel de Frascati, dans les limites de la disponibilité des données. En outre, au-delà de la seule observation statistique, la publication intègre une dimension prospective, qu'il s'agisse du vivier des chercheurs (doctorants) ou des projections de départs en retraite.